Ian Somerhalder is an actor, director, conservationist, entrepreneur and philanthropist, best known for playing Boone Carlyle in the TV drama Lost, Damon Salvatore in the TV drama The Vampire Diaries and as himself in National Geographic’s Years of Living Dangerously. He is the Founder and President of ISF. Nikki Reed is an actress, director, writer, animal rights activist and philanthropist, best known for starring in and co-writing the film Thirteen, Rosalie Hale in the Twilight saga and as herself in National Geographic’s Years of Living Dangerously. She is the Vice President of ISF. Together, their furry family includes 4 dogs, 3 cats and 3 horses, while also continuously fostering and advocating for the better treatment of all creatures. Their furry kids pictured are Ira and Nietzsche. 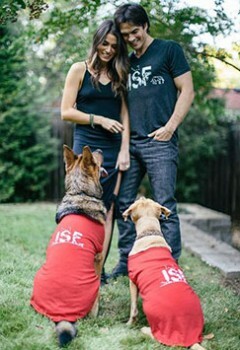 The Ian Somerhalder Foundation (ISF) was established in 2010 and aims to empower, educate, and collaborate with people and projects to positively impact the planet and its creatures by providing ISF programs and services and by providing financial disbursements to other tax-exempt organizations whose ultimate purposes are to conserve the environment and protect animals. The ISF Emergency Medical Care Grant for Animals Program was established in February of 2014. The grant provides financial assistance to animal welfare organizations, agencies and individual rescuers responsible for the care of animals recovering from abuse, neglect, injuries suffered from a traumatic event or other illness. The purpose of this grant is to provide animal victims a second chance by alleviating their rescuers of the financial stress of treatment so they can focus on facilitating the animal’s adoption into a permanent, loving home. Since 2014, ISF has granted over $200,000 to help over 1,000 creatures, including dogs, cats, pollinators, horses and other farm, exotic and wildlife animals. Each animal’s journey has shown us the true meaning of strength, love and will, for both man and animal.